The COMBI 120H and its accessories have been developed with the intention of manufacturing an automated cleaning system which both meets the requirements of industrial companies for a continuous cleaning process, and minimizes consequential costs of machine / plant cleaning and maintenance. The COMBI 120H is an automated system that combines dry ice pellet production with dry ice blasting. 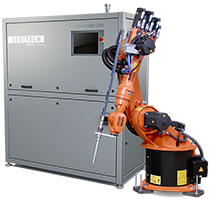 This automated solution allows for dry ice blasting equipment to be integrated within a production line via a robotic system. The automated system is equipped with a pelletizer unit that guarantees continuous cleaning with freshly made dry ice. The automated system is placed in a sound reduction chamber that allows for the control of noise as well as the extraction and filtering of air.